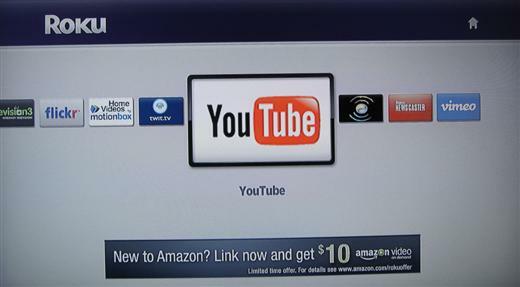 Are you looking for YouTube on your Roku (HD or SD) digital media player? If so, then you’re in luck, as there is now a method to do it. As stated in my Roku HD review, YouTube access from a Roku box was one of the missing features that I (and many other Roku owners) sought the most on the Roku platform. 1) First you’ll need to link your Roku player to your Roku account, if you haven’t already. You can do this at http://owner.roku.com. Create a Roku account if you don’t already have one and then link your player. 2) After linking your player, on the My Account page, click on the option to “Add a Private Channel“. 3) Enter the code B8VVK for the YouTube channel and then click the Add Channel button. 4) On your Roku player, click on the Home button to get to the home screen, then browse into your channels. Scroll through your channel list, you should now see a YouTube channel as one of your options. After selecting the YouTube channel, you’ll be able to add your YouTube username by scrolling to the “Settings” section on the far right on the top menu. 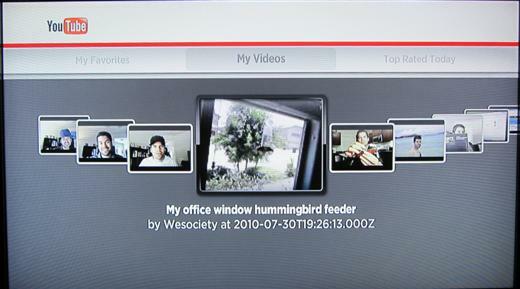 Adding your YouTube username provides you with quick access to your own videos in the “My Videos” section, as shown below. You can browse other YouTube videos in a variety of manners with “Top Rated Today”, “Most Viewed Today”, “Recently Featured”, “Recently Added”. A search option is also available for finding a specific title that you might be looking for. I really love that I can now watch YouTube videos on my Roku player. I hope you do too. The Roku YouTube channel is courtesy of TheNowhereMan, who has also developed a few other excellent Roku channels such as the Roku Newscaster. If you’re interested in buying a Roku player, you can purchase one directly from Roku or at Amazon. YouTube on Roku Update 1/30/2012: As noted in the comments section below, the method for obtaining a YouTube channel on Roku as described in this article is no longer possible, as Roku has removed the unofficial private YouTube channel at the request of Google. Because of this article’s popularity, I sent an email to Roku asking for an update on the availability of an official YouTube channel on Roku and they replied saying “We don’t have any more to comment other than what’s already made public.” So at this time, Roku is refusing to comment on the matter. I hope that all of you YouTube seekers will be able to obtain a Roku channel soon, but if not, maybe it’s time to switch to another solution like Google TV? For those of you who are now getting an error while trying to add the YouTube private channel: I’ve heard that Google has forced Roku to disable the channel and that the 2 are now in negotiations. So if you haven’t added the channel yet, it looks like you won’t be able to watch YouTube content through your Roku device. For those that already have the channel added, it appears to still be working, for now. I am still getting the error. Is there anyway I can have an email note sent to me when YouTube comes available on RoKu? Apparently the method of obtaining YouTube on your Roku mentioned in the post above is no longer working, as Roku removed it at the request of YouTube (Google).